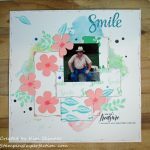 I have another scrapbook page to share with you. Actually, I’m sharing my homework assignments with you! 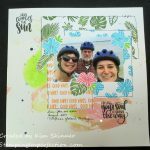 In the Stamps Meet Scrapbooks class that I’m taking, Lesson 3 was about trying a watercolor emboss resist technique to create the background of your scrapbook. 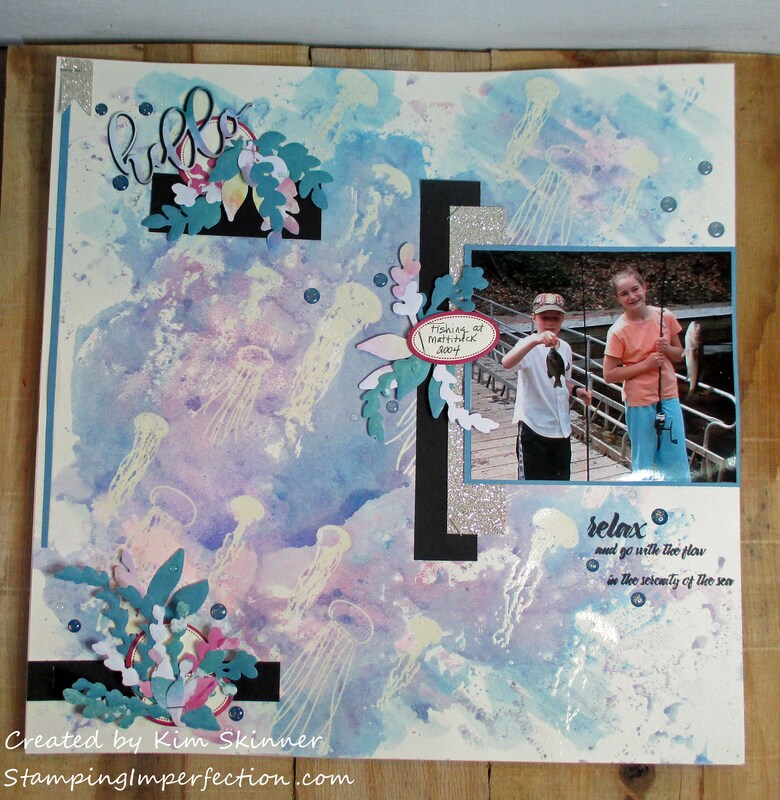 The technique gives an interesting effect for a background and I am not sure I ever would have thought about using it for a scrapbook layout page! My background ended up being very busy, so I adopted a less is more attitude for the rest of the layout. 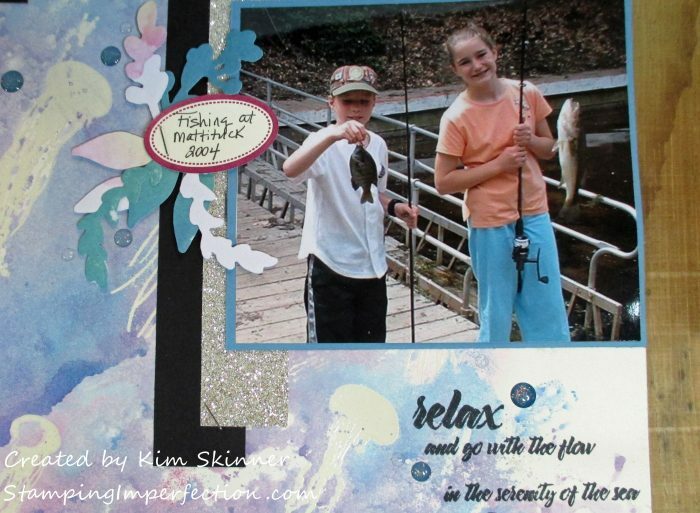 This technique involves heat embossing stamped images over the 12 x 12″ page and then squishing on watercolor. I used a window sheet to scribble very watery watercolor paint onto and then flipped it over onto the scrapbook paper and squished the paint into the paper. 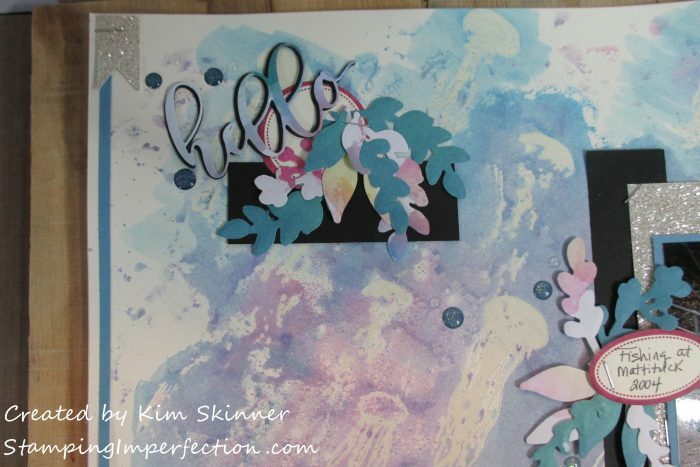 The embossed areas resist the paint so your images show up, even if in a subtle way. I’ve used Very Vanilla card stock. It’s time to replenish my 12 x 12″ white card stock paper supply!!! Again, I found this to be a quick and easy background to make. It did warp my paper as it dried, so I attached this page to a second piece of 12 x 12″ paper with double sided sticky tape. I really like the effect. I’ve used Altenew’s Painted Jellyfish stamp set as my background image since I selected a fishing picture. I used a combination of pink, purple and blue paints to give it a dreamy ocean water effect. I love the variation in the colors around the paper. You really have no control over how it turns out. This is a technique where you really have to embrace the imperfections. They are supposed to be there! 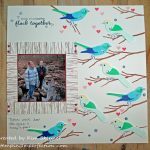 I used some die sets and a couple of pieces of Altenew’s Our Family Scrapbook Collection papers to create the embellishments for my page. The dies came from the Wings of Hope set. I felt like they looked the most like seaweed of all the dies in my stash. I also used a stamp and die set called Dot Labels. They are the Berry Burst colored ovals and circles that you see. This set actually makes perfect labels for things and great little labels for scrapbook pages. 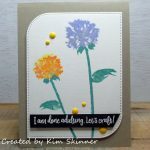 The Hello Script sentiment came from the Flower Arrangement die set. I cut it once out of the scrapbook paper scraps and 3 times out of black. I stacked them so the black was a little offset. I felt like the dies and sentiment were being swallowed by the background, so I added some black scraps in various sizes around the page below my die arrangements. I really felt like that made the embellishments and the photo pop off the background. I also added a touch of silver glitter paper and some Marina Mist scraps that I had sitting on my desk. I attached most of the embellishments with staples. I love my little craft stapler for projects like this. If you don’t have one, it is well worth the investment. You might even want to consider getting a long reach one so you can staple across a larger page like this. I have a regular sized stapler and I tend to staple everything together and then pop it onto the page with adhesive of some sort. Remember to use archival quality adhesives that are acid free adhesives that are made for scrapbooks. The acids can yellow over time and damage your photos. 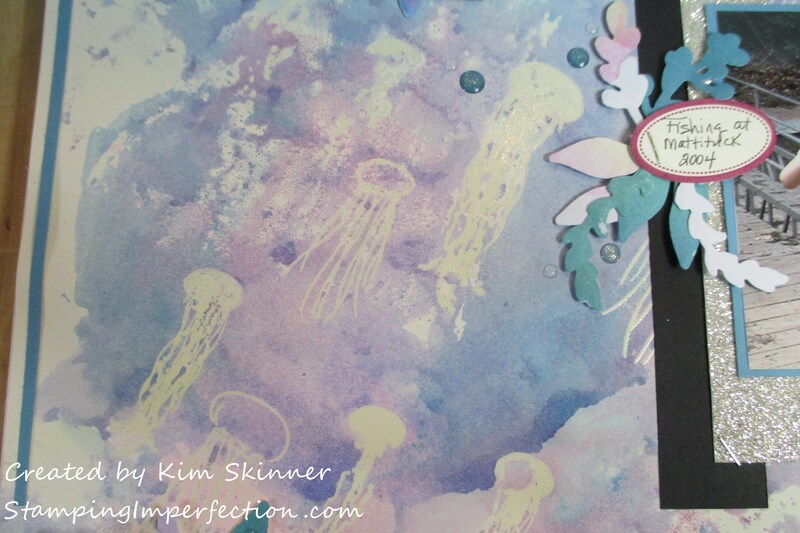 I loved the sentiments in the Painted Jellyfish stamp set, so I used them under my photo. My kids are all grown up now an in their 20’s, but these fishing trips certainly influenced their careers and hobbies. Doesn’t that little dot label work great to label the location and record the date for a photo? You can also see that I layered some silver glitter paper over the black strip here with the embellishments on top. It draws your eyes to the important elements on the page. I did the same thing with the extra bits in the bottom corner essentially creating a triangle with the black element and the die cut embellishments. For my final touch, I added some blue glitter dots and some clear droplets which you can barely see! I liked this page and I have to say that I’m enjoying pulling out these pictures and revisiting happy memories! WOW. The colours are just PERFECT with that stamp. 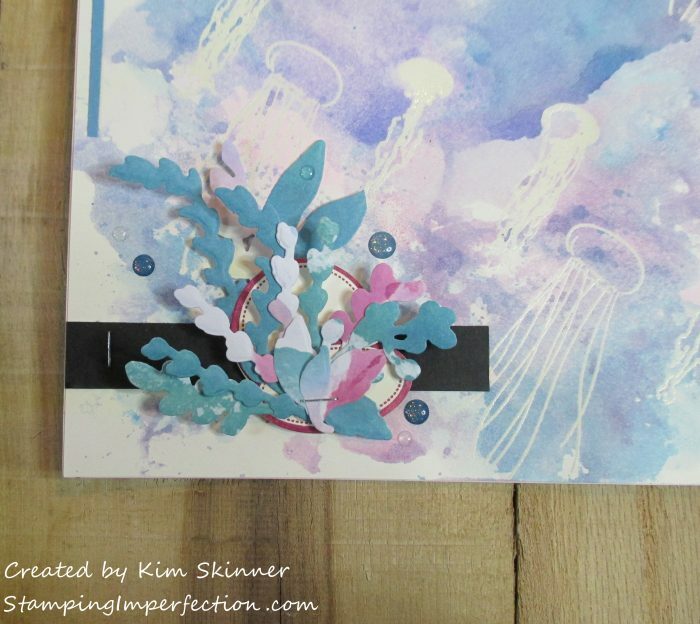 And I love how your die cuts look like seaweed.